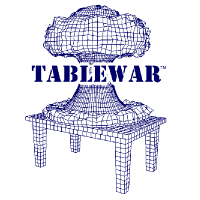 Table War Designs, Inc. is TABLEWAR®! We specialize in premium products for the serious hobbyist or gamer including the original neoprene backed gaming mat, a full line of display, storage, & transport cases, small-scale photography backdrops, and transparent gaming overlays. 20% OFF everything at TABLEWAR®! No Comments on 20% OFF everything at TABLEWAR®! TABLEWAR’s new ‘Planet Series’ FAT Mats are worthy of a Legion! No Comments on TABLEWAR’s new ‘Planet Series’ FAT Mats are worthy of a Legion! TABLEWAR F.A.T. Mats – New Cobble Town Designs up for pre-order! No Comments on TABLEWAR F.A.T. Mats – New Cobble Town Designs up for pre-order! TABLEWAR now has 6×3′ F.A.T. Mats! No Comments on TABLEWAR now has 6×3′ F.A.T. Mats! No Comments on Discounted Shipping from TABLEWAR! TABLEWAR’s new F.A.T. Mat Designs shipping in the US! No Comments on TABLEWAR’s new F.A.T. Mat Designs shipping in the US! TABLEWAR™ MacroMat KickStarter is live! No Comments on TABLEWAR™ MacroMat KickStarter is live! TABLEWAR(TM) Mini Case now for sale! No Comments on TABLEWAR(TM) Mini Case now for sale!